For my first memoir I wrote about love. I believe that love is someone who stays by your side through everything that happens to you. They should be your support and your comfort. 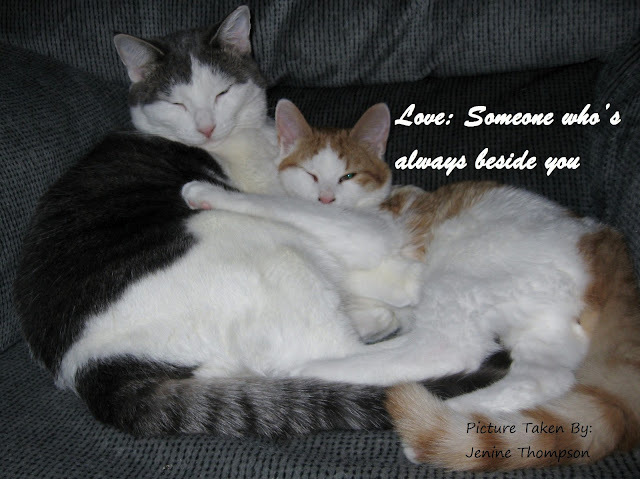 I chose this picture of my two cats together because of the touching story behind them. When the orange one (Milo) was a kitten, he was the runt of his litter and was left to fend for himself in a house full of feral cats. We rescued him and brought him home but he was too young to be away from his mother. We were worried about him but we soon saw that there was no need to worry. The grey one (Missy) took him in and cared for, taught him everything a house cat needs to know and kept him out of trouble. To this day they still look after one another as you can see from them napping together in their favorite chair. So cute! I have two cats myself, and while they love each other dearly, they never sleep together like this.